Garage Sheds from Cheap Sheds. These buildings are ideal for people who require a large storage solution. 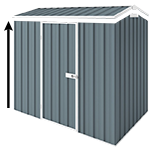 You can now order EasyShed Garage Sheds from Cheap Sheds. They are large workshops but has an affordable price compared to garages. These products cater for people who require a large storage solution. Garage Sheds are the perfect size to provide shelter and protection for large investments that cannot be kept in the home. This Zinc model is extra long and has added width so you have plenty of room to move around. You may even consider using the extra space or the entire thing for a workshop! Garage sheds are much like all our products and will come flat packed with everything you require for assembly. DIY is easy and instructions will be provided. We offer a variety of accessories with our Garage Sheds. To help save time and money we recommend you consider adding them to your kit before checking out. Shelves, windows and locks are just a few items that could make your life easier. NOTE: The image is for illustrative purposes, chosen dimensions will reflect in the end product.